September 26, 2016 - SHINRYO CORPORATION ("SHINRYO") has opened a branch office in the Republic of Mauritius in the Indian Ocean east of Madagascar Island, Africa. 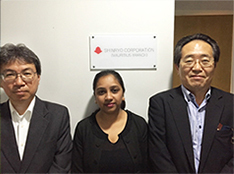 SHINRYO is now the first company in the Japanese construction industry with a branch office in the Republic of Mauritius. The Republic of Mauritius, despite its small size similar to Tokyo, has become a leader in development among various African countries with a 4% GDP growth rate representing nearly 10,000 dollars per person. In a recently built Business Park, IT companies with capital from India are setting up shop. The opening of a branch office will enable SHINRYO to unearth opportunities in finance and IT related infrastructure that are poised for rapid development in the future as well as become a foothold for advancement in Africa. SHINRYO was one of the first companies in the Japanese construction industry to deploy overseas in 1972 and has numerous achievements in infrastructure related construction, hotels, hospitals, and plants mainly in Southeast Asia and the Middle East. As a result, consolidated orders received totaled 250.9 billion yen in the period ending September 2015, and slightly less than 80 billion yen out of the 250.9 billion yen are orders received overseas which exceeds 30% of the overall total. This is a significant increase even compared to the previous year. Within this background, SHINRYO aggressively opened branch office. The branch office in Mauritius is the third branch opened in the last 3 years following branch openings in Myanmar in 2014 and Cambodia in 2016. SHINRYO also opened a liaison office in India which is closely related to the Republic of Mauritius in 2015, and we are currently carrying out market research. SHINRYO targets package contracts covering air-conditioning work, plumbing work, electrical work and plant construction as well as receiving orders mainly for transportation and energy infrastructure based on our experience and success in emerging countries that are expected to develop in the future in addition to assisting in regional development.